Ken Carson was born and celebrates his official birthday on March 11, 1961. He is a 12" tall vinyl doll and is Barbie's boyfriend. 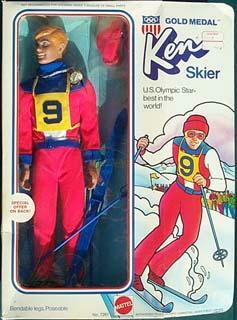 Ken is named after the Handler's (founders of Mattel) son. 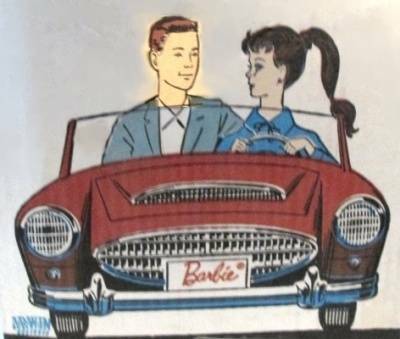 Ken, like Barbie is a slick dresser, with a fabulous wardrobe that he shares with several friends, he also has a car, vinyl cases and many accessories. The Ken doll like Barbie, also evolved over the years, but girls, he's still single! 12" tall vinyl doll with straight-legs, flocked hair (Fuzzy headed); blonde, brunette/black or brownette/lighter brown, a hollow torso wearing red trunks with a white stripe on side, cork sandals with red vinyl straps, a black wire stand, yellow towel (the earliest produced dolls did not have the towel). Doll mark: Ken ™ Pats. Pend. © MCMLX by Mattel Inc.
12" tall vinyl doll with straight-legs, new painted hair in blonde or brunette, same body as earlier doll wearing solid red trunks either cotton or stretch jersey material, a red/white striped jacket with the collar stitched on was added, cork sandals with red vinyl straps, black wire stand, no towel was included. Same mark as 1961 doll. Doll mark: Ken ™ Pats.Pend. © MCMLX by Mattel Inc.
1/4" shorter than previous dolls, loose legs, pronounced kneecaps, fatter arms & hands. Rest same as prior doll. New Markings. Doll mark: Ken ® © 1960 by/Mattel, Inc. Hawthorne Calif. U.S.A.
Doll mark: © 1960 by Mattel, Inc. Hawthorne Calif. U.S.A.
New bendable legs, red trunks, blue jacket with a "K" initial, blond or brunette molded hair, cork red sandals, black or wire stand. Same muscular body as #1111, brown molded hair, blue eyes. Now wearing a mustard open slit shirt, multi-colored swirled print trunks (same print as 1142 Brad Doll Bendable Leg 1970). All new head and body, Ken's been working out and it shows, a much more muscular body, new solid red trunks and jacket with bronze buttons, new clear X stand. 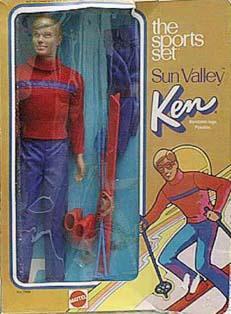 In 1970 Ken got new clothes now he came dressed in red shorts and a red jacket. New orange and turquoise jacket, same marks as above Ken. 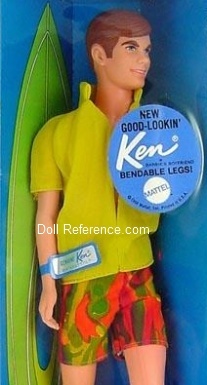 Both the English & Spanish speaking Ken had the same attire. Markings same as above doll. New marks rest same as 1969-70. Same doll mark as below, same doll just no stage, instead this one has a posing stand. Brown molded painted hair, jointed moveable waist, bendable legs, brown suede fringed vest, multi-colored tricot shirt, gold satin pants and brown shoes. Has a medium blue stage, microphone & a 45 rpm record. Rest same as doll shown above. New suntan skin tone, painted molded blond hair, bendable legs, red trunks & a blue towel. Doll mark: © 1968 Mattel, Inc. U.S. & For. Patd. Other Pats. Pending Taiwan. New walking construction, brown molded hair, blue short sleeve shirt, tan/blue plaid pants & brown shoes. First to have bendable elbows. New hands that can grasp and hold items, bendable legs, blue jeans & red tank top, brown belt & white tennis shoes. Doll mark same as above Busy Ken, pretty much the same doll only talks & different outfit: wore red corduroy pants, red/blue plaid shirt, brown belt & shoes. New rooted brown hair, extra beard, sideburns & 2 moustaches, bendable legs, brown/white checked jacket, white turtle neck dickey, light brown pants & brown shoes. Doll marked same as 4224 Ken Mod Hair. Dressed doll, in pale blue brocade tux, black pants & bowtie, black shoes & red trunks. Rooted hair is much longer, to his shoulders, no bangs and no receding forehead like the early version, paler skin tone than earlier doll and the arms have the hands facing towards the back rather than towards the thighs. Same outfit. Now made in Hong Kong. 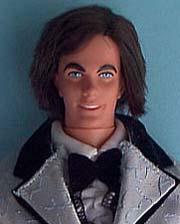 Ken has painted brown hair, free moving tab on back of doll makes it very movable. By rotating the tab the doll could appear to be bending, twisting or swinging an accessory. Both Ken and Curtis are wearing a one piece short suit, Ken's has solid white shorts with a red and white striped knit top, white shoes and socks, accessories are a golf club, tennis racket and ball.